Fantastic video by Pinehurst Resorts...for the U.S Open week upon us, here is a great piece from the 1999 U.S. Open. AWESOME to WATCH!! Click HERE to watch - On the 72nd hole in the final round of the Open Championship on the Old Course at St. Andrews, Zach Johnson rolled in a 30-foot birdie putt to post 15-under. He would go on to win in a playoff to claim the title of "Champion Golfer of the Year." FRANKLIN, Tenn. (WKRN) – As the British open came to an exciting end in Scotland on Monday, here across the pond, a Franklin company started to get very busy. That company is hoping to turn the short game into long term success. Johnson’s win at the British open is one for the ages. The champion graces the cover of the latest Golfweek magazine, but if you look closer, you’ll see the other star of this epic performance: his putter. SeeMore putters CEO Jim Grundberg said Zach Johnson “let the putter do the talking on Monday” on his way to his win in one of golf’s biggest Majors. Click HERE to continue with Story. 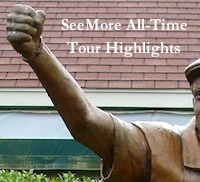 Payne Stewart won the most dramatic US Open in history in 1999 using a SeeMore FGP, taking only 24 putts in the final round at Pinehurst including one-putts on the final three holes and the longest putt to ever win the US Open on the final hole. Payne also won the overall putting title for the fewest putts per round in 1999. When the late Payne Stewart won the U.S. Open back in 1999 with a particularly strong putting performance, Jim Grundberg took note. Grundberg, at the time an executive at the big Odyssey (ELY) golf brand, was intrigued by the design of Stewart's putter, made by tiny SeeMore Putter. "We thought: 'Wow, that's something else," says Grundber. "We looked at (that putter) as a threat." Grundberg left Odyssey soon afterward but SeeMore remained in the back of his mind. After Grundberg and three friends later won a recreational scramble using Grundberg's own SeeMore putter, he became even more interested in the company, which by then was flagging. He called Jason Pouliot, a former colleague at Odyssey, and in 2006 the pair bought SeeMore, betting they could turn it around. They appear to have done so: In 2009, sales for the 10-employee company were $1.5 million, up from about $50,000 when they acquired it. The Franklin (TN) - based SeeMore accounts for a sliver of the golf equipment market, which totaled $2.8 billion in 2009, according to the National Sporting Goods Assn. Still, SeeMore's growth shows how entrepreneurs can jumpstart an existing business, using even the most basic strategies of new product introductions and marketing. When Pouliot and Grundberg bought SeeMore, the company was selling just one product, a putter invented by Jim Weeks, a golf instructor who founded the company in 1998. The design of the putter's head set it apart, commanding $150 at retailers' cash registers. When a player, looking straight down onto the putter, positions it so that the shaft appears to run between white lines - obscuring a red dot painted on top - the putter head is supposed to be square to the ball, increasing the odds of an accurate putt. "Hide the red dot" is an oft-repeated company marketing line. Click on PLAY button below to listen to today's radio interview from Jim Grundberg on The Back Nine. Tell your favorite sports talk radio station about SeeMore and we would be more than happy to have a radio, TV show or magazine/newspaper interview in your area. If you have someone that might be interested have them contact us here.